Alluring Bed Sheets Gives The Elegant Look To Your Interior. Everyone prefers to enjoy a luxurious lifestyle and adorn their interior design with best possible product. For such kind of desire, nothing can be better than placing bed sheets having ultra-urban appearance. 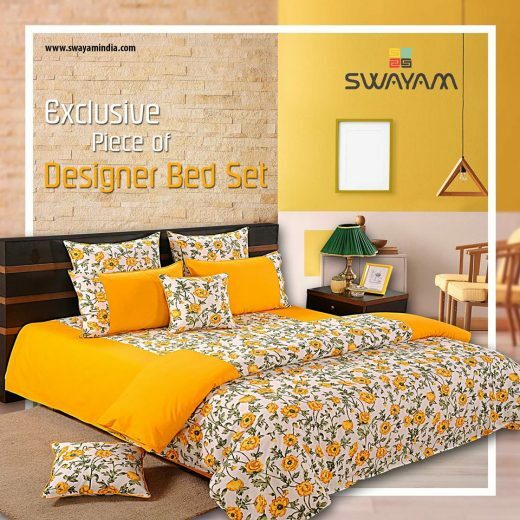 Designer bed sheets online from the collection of swayam are the best way to give an instant makeover to your living room. Having mesmerizing designs and elegant color schemes, exquisite crafted bed sheets bring a magical feel to your living space. With its ravishing design, these bed sheets not only enhance the beauty of your furniture but fills the overall ambiance with exciting moments. These are enriched with modernized design and bring modern feel to your overall ambiance. These bed sheets are reflection of pure luxury and say a lot about your living standard and style. Even an uninteresting space looks impressive with the presence of bedding set having beautiful concept. It fills energetic colors in your home interiors and make you feel astounding. These have been designed with rich art work to enhance the overall loveliness of your room. To minimize the chance of shrinkage and color fading, they have been pre-tested. They feature elegant prints and delicate themes to make your home interiors look gorgeous. With opulent design and mesmerizing patterns, they bring youthful experience to your personal space. When it comes to functionality, they ensure you a blissful sleep session with lots of unforgettable dreams. With its 100% color fast feature, these bed sheets allow you to use them on all major occasions. From magical linea to shades of paradise, there are various kinds of eye catching sheets that have been perfectly designed to adorn modern Indian homes. There is nothing better than returning home after a tiring day and laying down on comfy bed linen in order to provide solace and contentment to the body. To get high amount of comfort and relaxation, buy bed sheets from the collection of swayam and rejuvenate yourself. They are an easy way to maintain your bed room and to make it more engaging.